National Storm Chaser Convention Returns to Denver! I sent out a request awhile back asking folks who follow my page for cool and interesting weather topics to talk about since our weather looks quite for most of February. With no significant storm systems on the radar, this is an excellent opportunity to share what makes Colorado weather so interesting and how things in and around Castle Rock and South Denver influence the weather here. One topic that came up quite a bit is the “Palmer Divide,” what it is, where it is and what it means for our weather in Colorado. The divide is often talked about on the local news when a big storm system moves in, but specifics are rarely mentioned. With that, let’s take a look at one of the most important influences on our weather South of Denver. 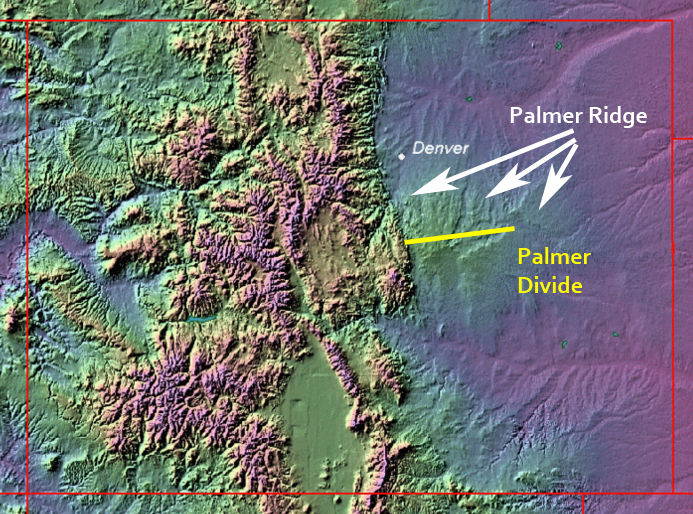 What Is the Palmer Divide? 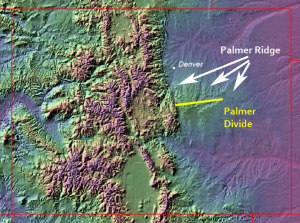 The Palmer Ridge (also called Palmer Divide region) is an elevated section of land South of Denver. You can see this quite clearly when driving South from Denver into the Lone Tree/Parker areas. The bluffs and ridges are the first sign of the rising terrain. 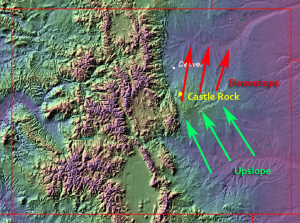 As you make your way through Castle Rock and on Southwards to Larkspur, elevation continues to rise, finally peaking at Monument Hill just before Colorado Springs. 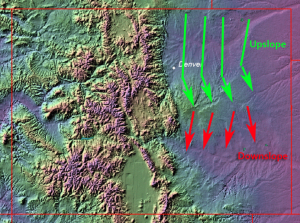 Notice the lighter colors denoting higher elevations South of Denver in the image below. A topography map showing elevations in Colorado. The Palmer Ridge rises South of Denver finally peaking at the Palmer Divide. These two terms are often used interchangeably. The divide itself separates the Arkansas and Missouri River Basins in Eastern Colorado and roughly runs from its Western point in Palmer Lake, East roughly 80 miles to near Limon. The uplifting of the terrain in these areas causes the weather to behave differently, in fact storms can behave considerably differently from Denver to Castle Rock or Denver to Colorado Springs. These cities are often mentioned as being along or on the Palmer Divide and often see more intense weather effects. Severe weather and snow storms can behave quite differently for cities and towns in this region. First, I’ll mention something; for right now we will just look at winter weather (since it’s that time of year) We will look at spring and summer weather (severe, tornadoes, hail) as we move into that season a bit later. One of the things that makes Colorado weather so interesting is the effect our terrain has on the weather. You often hear TV Meteorologists say the mountains are getting hammered with snow while we have a warm, dry, windy day down in Denver and along the front range. 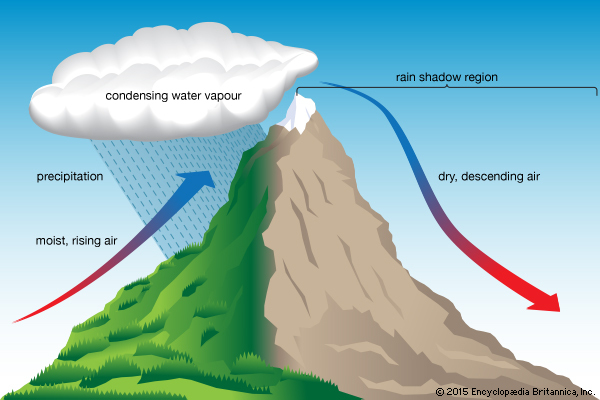 This all stems from Orographic Lift… the less nerdy/technical term for this is “upslope” or “upslope flow.” As moisture laden air streams in from the West and is forced to rise over the mountains, it eventually cools and becomes saturated, causing rain or snow to fall. As the air moves over the mountains and down the lee-ward side it warms and drys out. This is a common pattern we see with Colorado storms moving in from the West all the time, but the same effect happens for cities along the Palmer Divide. 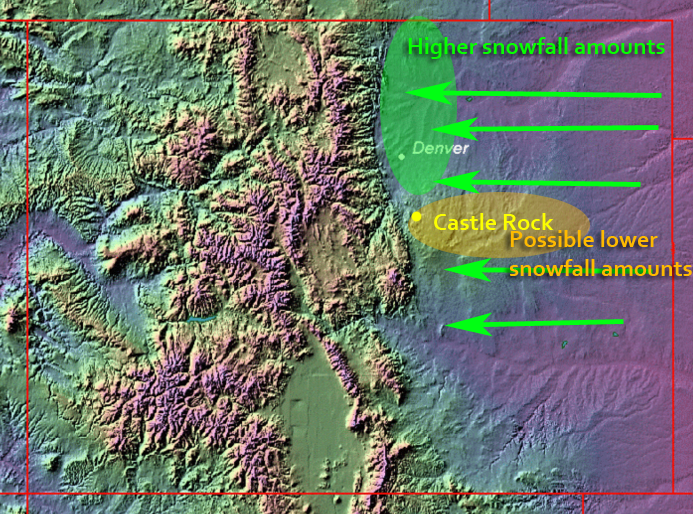 Let’s go back to our previous image and examine a couple of common winter-time scenarios and how it impacts how much snow we see in the Castle Rock and Palmer Divide region. 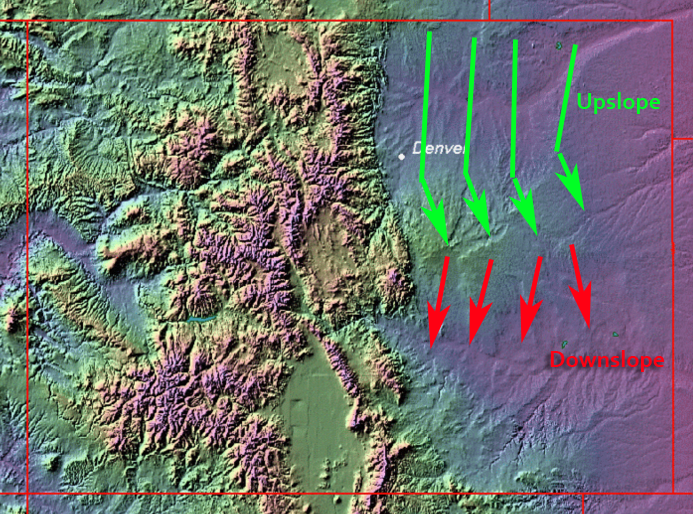 Northerly and Northeasterly winds (with enough moisture) cause an upslope effect South of Denver as the wind is forced to rise with the terrain. Areas South of the Divide into the Springs and Pueblo usually don’t see as much moisture and can see strong winds with this type of setup. As you can imagine, Southerly and Southeasterly winds are not good for snow on areas North of the Divide. The change in winds creates a downsloping affect that dries out the air. This can eat away any moisture in the atmosphere and dampen our chances for snow in Castle Rock. There are many special cases to this rule along the Palmer Divide. Strong easterly winds may dump more snow in Denver or Colorado Springs (one only or both depending on storm track) as they receive an enhanced upslope affect. The Palmer Divide region may not get the same result, or sometimes it will. The exact direction of the wind and ability of it to rise along the terrain makes all the difference here! Now that we have a decent understanding of what the Palmer Divide is, where it is and how we can influence storms and precipitation based on terrain we can take a look at the slightly bigger picture. In our next article we will zoom out a bit and examine how large scale storms behave when coming into contact with the Palmer Divide! We’ll also take a look at what we need for the perfect snow storm (AKA blizzards) and what factors can make those storms bust.